More than a hundred years ago, Delbera Axebringer - a might warrior and dwarven leader - slew the necromancer Audalot Karexin, but spared his young apprentice Zohir. In the ensuing decades, the bitter survivor brooded and plotted her revenge. Now, descendants of the Axebringer clan are vanishing, dragged screaming into the darkness by the animated bodies of their fallen kin. The Axebringers and their home town of Davarn need heroes to break this family curse. What mysteries lie sealed within Delbera Axebringer's ancient abandoned fortress? And what challenges lurk along the blighted Path winding through the Darklands beneath Golarion's surface? 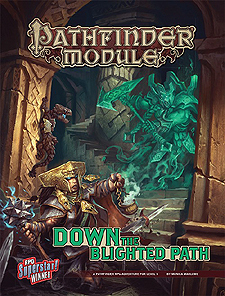 Down the Blighted Path is a deluxe adventure for 5th-level characters, and includes 64 action-packed pages of exciting battles, supernatural mysteries, and monstrous foes, plus a gorgeous double-sided poster map featuring an overview of the dwarven trading post of Davarn and a miniatures-scale battlemap. The author of this of this adventure, Monica Marlow, was the sinner of the 2015 RPG Superstar contest, in which hundreds of unpublished authors competed for the chance to write a Pathfinder Module. In addition to her adventure, this book contains a host of new monsters and magic items designed by the contest's runners-up. Players can expect to reach 7th level upon completion of this adventure - if they can survive its deadly haunts, Darklands horrors, and furious villains both living and undead!